Last post, I talked about how exotic plants (plants from ecosystems not near you) have about as much value to wildlife as a plastic plant. Today, I would like to compare two trees. One a native and another that has about as much value to wildlife as a 70 foot statue. 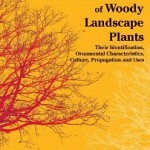 Oaks and Ginkgo trees are two of the most revered trees in the plant world. Comparing each of their value to our ecosystem however, shows one to be a true giant while the other is but a twig. For instance, native oaks support 557 different species of native butterflies and moths. 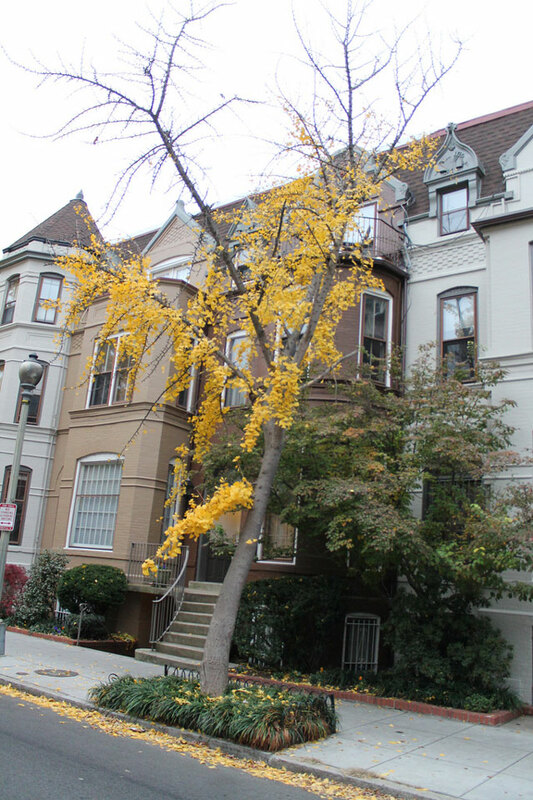 The non native ginkgo tree supports 3 (although most arborist will say they have never seen ANY natives feeding on it). 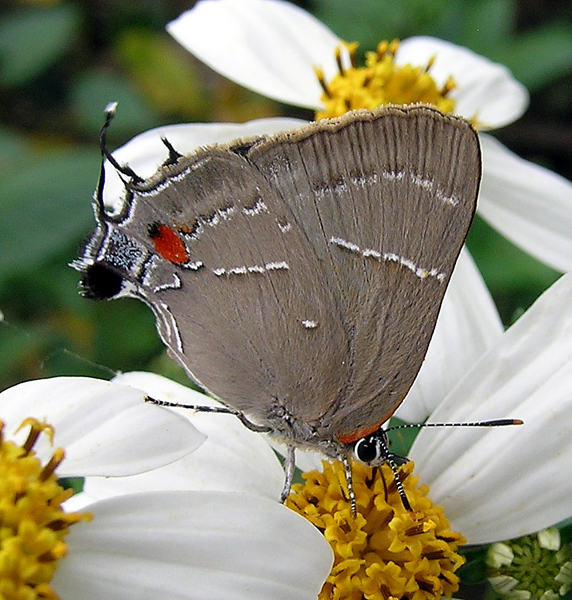 A native of the southeastern and midwestern US, the caterpillar of the white m hairstreak butterfly only feeds on native oak trees. I agree Ginkgo has a cool leaf and 100 year old specimens can be very attractive. However for the first 30 years of their lives, they are awkward looking trees. I’d take a 20 year old red oak (Quercus rubra) over a 20 year old Ginkgo in my landscape ANY day. The oak will be much larger, look better in all seasons, AND support the wildlife in my area unlike the Ginkgo. 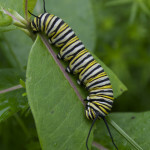 A lot of the insects that the native oaks support are moths that you may not consider to be as worthy of keeping around as the Monarch butterflies I talked about in my last post. But consider that 96% of nesting birds feed their young insects exclusively and these moths and their caterpillars are a large portion of those insects. If you like your Bluebirds, Chickadees, Nuthatches, Orioles, or Warblers just to name a few, you should know they all feed their young moths or caterpillars. You might think that planting exotic plants that have fruit birds eat helps them. It really does not as they only eat this fruit for energy before they migrate and it is no help for them in raising their young. Then of course there is the wildlife that feeds on the acorns of the oaks. These include gray squirrels, red squirrels, flying squirrels, chipmunks, deer, rabbits, opossums, raccoon, wild turkeys, crows, blue jays, quail, wood ducks. In fact more than 100 U.S. vertebrate species eat acorns. To put it bluntly, native oaks trees are vastly superior to Ginkgo trees if you care about birds, butterflies, or other wildlife or the environment in general. Restoring large stands of oaks to suburbia would go a long way toward shoring up the future of our nation’s biodiversity. Planting small oak trees is easy and cheap. This burr oak will slowly transform from a bush to a tree in the first decade of it’s life. 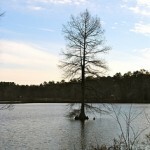 Willow Oak (Quercus phellos) – One of plantsman Michael Dirr’s favorite landscape trees for zones 6 to 9. Dwarf Chestnut Oak (Quercus prinoides) – Only gets 20 feet tall and is usually more bush like than tree like. 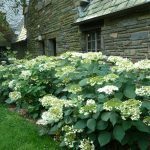 If you are not from the US or you want more oaks to choose from, there is a great list of oaks and where they are native from at Wikipedia. Click here to go there. Next time I take a look at the natives and exotics in my own yard and show you how to do the same. I will also cover some ideas for changes we can make to make our yard more wildlife friendly. Great article Jim. It was very informative. Thanks Valerie, I am glad you liked it. 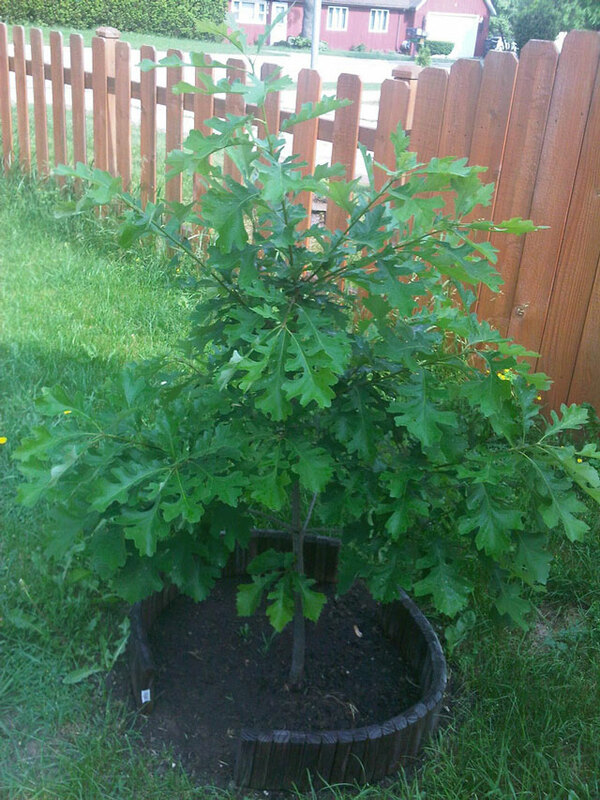 If one person plants a native oak tree instead of a ginkgo because of it, then I consider it a success. I agree. Been preaching this for years. Thanks for the good article.